99% of todays math literature are typeset with a typesetting language called “LaTeX”. There is basically no other way nowadays to publish mathematical texts in a decent form. In earlier times publishing mathematical texts was tedious. Sometimes an article got published by a journal with an editor who could afford beautiful mathematical typesetting like in the left image in Gauss’ work Disquisitiones Arithmeticae from 1801. (As a little side comment: The full works of Gauss are scanned in by the state and university library Goettingen, which already scanned in about 12000 books in high quality. Probably the library is not having the same problems as google with french editors…:-)). However sometimes there where no extra mathematical metal types, so formulas where included by hand. This holds especially true for the advent of typewriters: usually a secretary typed the text and the mathematician inserted the missing formulas by hand (a lot of math literature from last century has been written in this style). With the growing use of computers also various math typesetting programs came on the market (like e.g. the program EXP :-O) , but the by far most sucessful programs were TeX , developped by Donald Knuth in 1982 with its plain macro package and its modified macro package LaTeX written in 1984 by Leslie Lamport. Both packages are based on the same TeX programming language and used by default fonts made with Donald Knuths ingenious METAFONT program. Metafont is basically a program which allows the generation/programming of vectorized fonttypes which then get rastered by the system for a required resolution or output device. Since these types are “vectorized” there actual form (like size slant etc.) can be controlled via parameters. A demonstration about changing parameters in a fonttype created with metafond can be found in our gif animation surrealey. 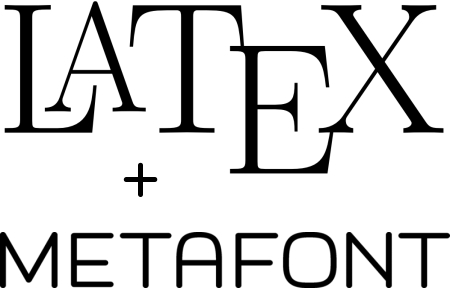 Although Donald Knuth collaborated with graphics designer Hermann Zapf (creator of Palatino and Optima) metafont and LaTeX/TeX seem not so well perceived by the typography community. Knuth attributes this to the fact that “asking an artist to become enough of a mathematician to understand how to write a font with 60 parameters is too much” (in Donald E. Knuth. Questions and Answers II, TUGboat 17 (1996), 355–367).